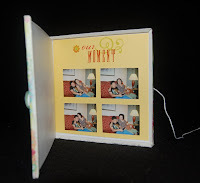 Well, back to the mini scrapbook kits. There are several companies who have kits, which include all the embellishments needed to complete a project. I am particularly fond of K and Co. kits because they have sparkly do-dads, ribbons, paper, etc. From their Berry Sweet line I made the little purse with a few changes. (See photo.) I thought that the flower on the front was too big and stiff so I punched out another one (using a Magic Punch) and K and Co. paper that was printed on one side and glittered on the other. I think it’s fun to change up the kit projects to suit your taste and you can always incorporate the extra items from the kit into another project. Anyway, the inside pocket was large enough to accommodate several photos so I was happy to quickly scrap a two-day visit with my sister. We did lots of shopping on that trip, so the purse shape of the mini-book seems appropriate. After making the kit I thought that the low cost might make it a great party favor for a young girl’s birthday. The guests could take instant photos or you could quickly print up digital ones. Making the booklet would be good party activity. If you have too many guests to afford the kits, perhaps you could make a simple purse from cardstock and supply embellishments, paper, and tools to your guests. I have been a collector of vintage and antique items for decades. Most of my treasures have been discovered at garage sales, flea markets, and antique stores. Usually I can’t resist purchasing some old china or jewelry. Recently in an antique store I saw a clever use for an old dessert plate. 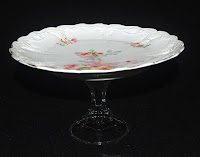 It was something like a cake stand with a pedestal made from a glass candleholder. Using an old European porcelain 8” plate and a 4-1/4” glass candleholder (from Ben Franklin Crafts), I was able to recreate the piece I saw. (See photo.) I glued the two pieces together with Loctite glass glue. The glue is a little watery so it is easier if you turn the plate upside down, place the candleholder (small end down) in the center of the plate, and then apply the glue at the joint. If you decide to try to make this dessert stand, please don’t use any plate before checking that it is not valuable. Personally, I would never use a dish from a set or one with a maker’s mark. Unmarked, non-hand painted, single plates usually have little value so I am comfortable recycling them. I plan to make lots of these mini-cake plates and give them as Christmas gifts along with my homemade cookies. I love the new K and Co. papers called Berry Sweet and Mira. Since their color palettes are similar I think they work well together. A while ago I saved a wooden CD holder that came in the mail with a free demo disk. After peeling off the outer paper I decided that it would make a cute card if re-papered with some of the Berry Sweet line. I used the Martha Stewart decoupage glue and it worked really well as both glue and sealant. By adding a beaded Berry Sweet flower and a Mira dimensional sticker the cover looked just right. 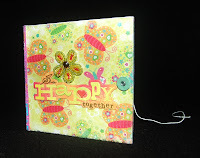 A disk and string closure by Making Memories completed the outer part of the card. Inside I used rub-on (K and Co., Mira) words and series of photos. (See photo.) I was very pleased that I didn’t throw away the free wooden CD box because the recycled card is just perfect for my computer-loving son’s birthday. Last week I purchased some great new craft supplies for wool felting. Manufactured by the Clover Company, these new items included felting wool in luscious colors, felting needle tools, and appliqué molds (rose, daisy, etc.). As soon as I got home I started to try out the new craft supplies. Although Ben Franklin Crafts did not have the felting block to work on, I found that a block of Styrofoam worked well as a substitute except for the fact that little bits of Styrofoam have to be picked off the back of the felted item. Anyway I was pleased with my first attempts at felting using the molds. (See the blog photo and website project for a hat card with felted rose.) I think that I might be able to create my own felted items using cookie cutters for molds. The orange daisy is actually a pin eyeglass holder. I used a piece of wire to attach the small side of a figure eight key ring to the pin back (one with holes). Amy in the Mapunapuna Bead Shoppe uses this figure eight key ring to make her angel pin eyeglass holder. I thought it was a great project so I ‘borrowed’ the idea to make this flower pin eyeglass holder. More later about my shopping and crafting discoveries….